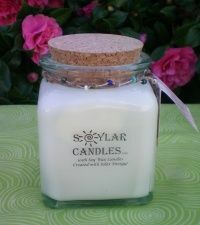 Handmade soy candle in a 19 ounce recycled glass jar. 100% Recycled glass, made in Spain from rescued bottles. Select your choices from the menu below and I will make your candles fresh for you. Candle does not come with beaded accessories as we no longer make them.